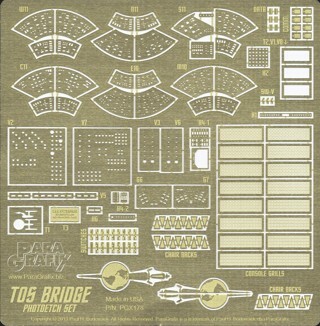 Add extra detail to AMT's classic USS Enterprise bridge kit. Specially designed to work with the newly released full bridge, and the impeccable decals designed by TOS Graphics. Raised switches and "floppy disks" add extra surface texture. Frames for the alert lights. Grills with the correct pattern for beneath each station. The triangular details on the back of each chair. BONUS: Two copies of the Mirror Universe's imperial insignia. One copy is split in two so each half can be placed on each panel of the turbolift door.